Name of two societies for combating anti-Semitism. The first was formed in Berlin toward the end of 1890 by twelve men who issued an appeal to the German people, calling upon Jews and Christians alike to fight the excesses of anti-Semitism and especially all attempts to rob the Jews of their rights of equality. This appeal, issued in Jan., 1891, received 535 signatures from among the most prominent men of Germany. The poets Freytag, Heyse, and Sudermann (the first, on account of the Jewish characters in his novel "Soll und Haben" and in his drama "Die Journalisten," had been considered a partizan of anti-Semitism); scholars like Mommsen and Erich Schmidt; politicians like Von Forckenbeck and Baron von Stauffenberg; and Protestant clergymen like Dreyer and Zittel—these were among the signers ("Allg. Zeit. des Jud." Jan. 29, 1891; "Mittheilungen," etc., Jan. 30, 1901). A similar society was founded in Vienna July 20, 1891 ("Oesterreichische Wochenschrift," 1891, p. 526), of which the most prominent organizers were Baron and Baroness von Suttner and Professor Nothnagel. These societies counted mostly upon Christians for support, although Jewish members were accepted. The Berlin society reported at its first general meeting, Nov. 28, 1893, a membership of 13,338 distributed in 963 localities. Its presidents were the eminent jurist and statesman Rudolf Gneist (up to 1895) and the liberal politicians Heinrich Rickert (up to 1902) and Theodor Barth. The propaganda of the societies was carried on chiefly by means of popular literature intended to check the growing anti-Semitic movement. 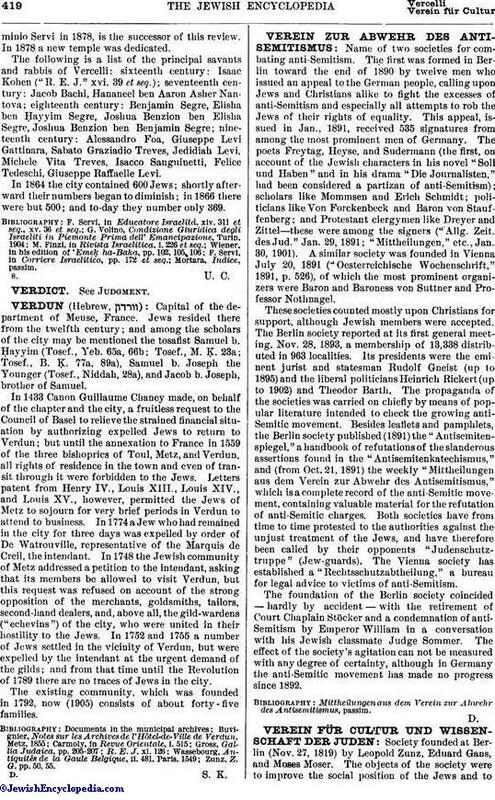 Besides leaflets and pamphlets, the Berlin society published (1891) the "Antisemitenspiegel," a handbook of refutations of the slanderous assertions found in the "Antisemitenkatechismus," and (from Oct. 21, 1891) the weekly "Mittheilungen aus dem Verein zur Abwehr des Antisemitismus," which is a complete record of the anti-Semitic movement, containing valuable material for the refutation of anti-Semitic charges. Both societies have from time to time protested to the authorities against the unjust treatment of the Jews, and have therefore been called by their opponents "Judenschutztruppe" (Jew-guards). The Vienna society has established a "Rechtsschutzabtheilung," a bureau for legal advice to victims of anti-Semitism. The foundation of the Berlin society coincided — hardly by accident — with the retirement of Court Chaplain Stöcker and a condemnation of anti-Semitism by Emperor William in a conversation with his Jewish classmate Judge Sommer. The effect of the society's agitation can not be measured with any degree of certainty, although in Germany the anti-Semitic movement has made no progress since 1892. Mittheilungen aus dem Verein zur Abwehr des Antisemitismus, passim.